An interview is always a high-pressure situation. No matter how much you prepare your answers, you might look back and wish you had said something different. The same goes for the portion at the end of your meeting when you’re the one in charge of asking questions — you might’ve forgotten something important you wanted to know about the job and the company. Nowadays, it’s considered common courtesy to send a thank you note or email after your interview. It should include everyone who spoke to you during your meeting and provide a quick reminder of your qualifications for the position. You should also throw in a thank you for the initial meeting or interview, of course. You can also use this message to ask a question of your own, too. Just make sure your note is short enough so your question doesn’t get lost within the rest of it and overlooked. To make things easier to read, start a new paragraph after each one or two sentences. By putting these further questions into a message after your interview, you’ll make a positive impression on the person who receives the email, as it shows you’re interested and thinking about the job. If you have more than one question in mind, tacking them all onto a follow-up email after the interview might feel overwhelming to the recipient. In that case, you could ask for a quick phone call, or, if they provided their phone number, simply pick up the phone and reach out to your point of contact. Chances are, they’ll appreciate the fact that you’re taking the step to reconnect and save them an email. If you send lots of questions, they have to type up lengthy responses, which takes time out of their daily schedule. A quick phone call can have everything ironed out quickly, and both of you will benefit from that. Again, this type of effort on your part will show you care about the job and might put you in even better stead as they choose the right candidate. 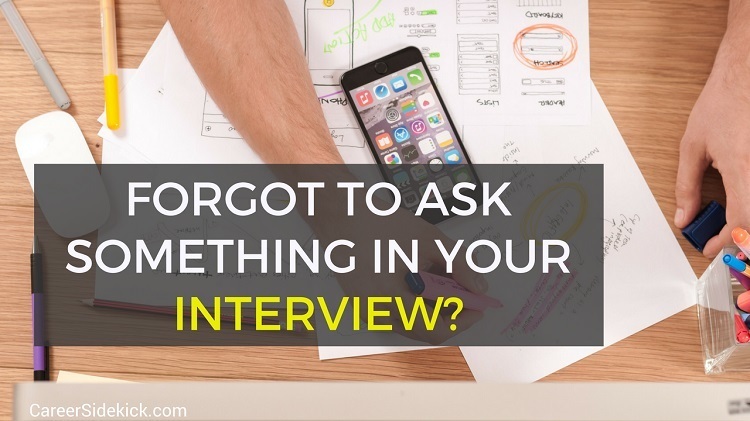 It could be you who asks for a second meeting, or it could be the recruiter calling you in for an additional interview. Either way, a face-to-face conversation could give you more insight into the place where you might work — and give you a chance to find out everything you need to know before accepting the job. Aside from the questions you want to ask, you should take a few steps to ensure you feel prepared for your next in-person meeting or interview. For starters, choose an outfit that’s equally as professional as your first interview. This will help you solidify the excellent image you created on the first go-round. A second meeting or interview might mean you’re speaking with new people, which is another great reason to schedule such an event. With more potential colleagues around you, you can get multiple answers to the questions you have, which will give you an even deeper insight into the company for which you could work. Another ideal time to ask your question is when you receive a job offer from the company. At that point, they’re doing their best to convince you to take on the role, so the ball’s in your court — ask as many questions as you need to help you come to the right decision. If you think an offer is on its way, start making a list of all the questions you want to ask before you make a decision. There are certain things you should always know before saying yes. You’ll want to understand the salary package, benefits system, vacation time and whether or not the company will pay you to move, among other questions. If that information still leaves you with doubts or unknowns, feel free to fire away another round of questions to get the answers you’ve wanted since your interview. Whether you pick up the phone or write an email, you have questions — and you’re going to get them answered. Your persistence in doing so, no matter how you decide to do it, will show potential employers just how serious you are about the position at hand. That kind of reputation is the one you want as you apply and interview for new jobs. So, don’t hesitate — reach out and get the answers you need. Both you and the employer will be glad you did. Sarah Landrum is a leading millennial career expert and the founder of Punched Clocks, a career and happiness blog for young professionals. Follow Sarah on social media @SarahLandrum and subscribe to her career newsletter for more advice on creating a career you love!